George Ramos, best known for being a three-time Pulitzer Prize-winning Los Angeles Times journalist, a Cal Poly journalism department chair and CalCoastNews Editor, has died. He was 63 years old. Police officers found Ramos’ body in a hallway of his Morro Bay home Saturday after CalCoastNews investigative reporter Karen Velie insisted they break into the home and check on his well-being. Ramos, who was suffering from increased complications from diabetes, had been unresponsive to staff calls for several days. Signs, out of the ordinary for Ramos, such as an old newspaper lying outside his front door, prompted Velie to call for help. While an autopsy has not yet been conducted, his death is suspected to be from natural causes. His time of death was not immediately known. Boisterous, fiery and passionate, Ramos was a man known for many things and when you crossed his path it was unlikely you could forget that fact. Ramos was a proud man and rightfully so, considering his life of many accomplishments. Ramos was also a man who put his aspirations for a conventional family life aside and instead dedicated his life to journalism and helping to advance the lives of Latinos. After his graduation from the Cal Poly Journalism Department in 1969, Ramos spent 25 years as a reporter, editor, bureau chief and columnist at the Los Angeles Times. But first he went to Vietnam. Ramos joined the war effort in 1970, serving as a second lieutenant in the U.S. Army. From Oklahoma to Kansas to West Germany, he was ultimately sent to the Quang Ngai province in South Vietnam. In 1971, Ramos saw combat duty as an artillery forward observer assigned to infantry troops and became a first lieutenant fire direction officer to support infantry troop movements. Ramos said his service to his country and the Purple Heart he was awarded after suffering a leg wound were his greatest achievements. As a Vietnam Vet, Ramos joined the Los Angeles Times in 1978 and went on to win three Pulitzer Prizes during his career with the newspaper, which ended in 2003. “George was particularly dedicated during his career to mentoring young Latinos and people of color to help them break into journalism, and he was a reporter who loved being a reporter and then tried to pass that on to students when he went into teaching,” said Bob Rawitch, fellow reporter and Ramos’ former editor at the Times. Ramos made history with his first Pulitzer Prize in 1984, becoming the first Latino journalist ever to win the prestigious Pulitzer Prize Gold Medal for Meritorious Public Service. As co-editor and reporter, Ramos was commended for leading a team of Latino journalists that produced a three-week series of stories about the roots, lives and aspirations of the 3 million Latinos who lived in California’s 13 southern counties. Then in 1993, Ramos took home his second Pulitzer Prize with the Los Angeles Times, this time for on-the-spot reporting on the riots that followed the verdicts in the Rodney King beating case. Ramos wrote a first-person column about being accosted by a gun-wielding rioter on the first night of the uprising in Los Angles. In 1995, Ramos was recognized a third time with a prestigious Pulitzer Prize for on-the-spot reporting of the Northridge earthquake that hit metropolitan Los Angeles in January of 1994. The renowned journalist returned to the place he made his start in 2003 by taking the role of Cal Poly Journalism Department Chair. His sense of humor seemed cunning at times as he often saved it for the serious moments, leaving a keen impression on those who knew him. As a sitting journalism professor at his time of death, Ramos nurtured many students, including much of the CalCoastNews team, during his time as a teacher and a department chief. In 2007, the National Association of Hispanic Journalists inducted Ramos into its hall of fame for being an industry pioneer whose efforts had resulted in a greater number of Latinos entering the journalism profession and for helping improve news coverage of the nation’s Latino community. In recent years Ramos lost his mother. His father had passed away years before. He is survived by his brother Dan Ramos. The CalCoastNews team is deeply saddened by the loss of its beloved editor and a great icon in journalism. You will be missed George. Thank you for living by example and inspiring me to push myself every day. George Ramos was a great man. I met him this summer in NAHJ Convention. He is a role model for me and for all hispanos journalism student. Dear, George, we will miss you. Just an idea here—if anyone wishes to contribute to Ramos’ memory, a donation to the CCN, perhaps? This is like learning an old friend has passed on. I moved from the LA area decades ago, but I still get an LATimes every day. All other newspapers pale by comparison. I feel like I’ve shared so many of the events that happened in LA with George Ramos. He was there for the earthquake, the King riots, and so many other events. My best wishes to all of the CCN staff. I hope your path to your grief is as easy as possible. 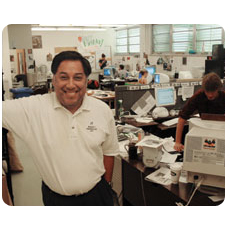 This is such sad news to come home to — George Ramos was a class act, an inspiration, an editor who took us to a much higher level at CalCoastNews. I am a better writer, a better person, for knowing George. We must strive to keep investigative reporting alive on the Central Coast. This must be George’s legacy in our community. Our thoughts go out to his friends and family. George Ramos was a great man who had an impact on many journalism students. He will be missed dearly. I am sorry to hear this news for such a young man… for anyone. It is amazing to me that there is some cynical reprobate out there who is so jaded as to give Roger’s message of condolence a thumbs down. The person could have easily missed the green box and hit the red one by mistake. It has happened to me before, and I’m sure I’m not the only person who goes cross-eyed after posting for awhile. I too am amazed at the negative thumbs for any of the comments so far on this thread; I am not a fan of Roger Freberg so I just didn’t hit either thumb, but I do appreciate his thoughts in such a positive manner. I do have to scratch my head about the other thumbs down, like the one on your comment as well as the one on Dave’s comment. The only thing about the passing of George Ramos that should be controversial is how young he was. Sad news. There is nothing quite as worthless as an anonymous thumbs down idiot, To CCN I don’t think that feature helps your website, my recommendation is to do away with it. If people feel a need to have their opinions count, then they can log in and tell us about it. Hey, I can’t stand Roger, but even if I used the thumbs up this wouldn’t be appropriate. I think that some people just like attention, even negative attention. In a weird way it’s they’re way to say ‘hey look at me’. They could care less about what the post says. That being said, I’m not going to harp on it anymore, I’m not going to feed into their game. Condolences to the family and friends, this is very sad news indeed.